This is my playbook for adding value to your business, so you realize a bigger multiple. When you’re in the process of building a business from the ground up, the last thing you’re thinking about is “selling it off”. When you began building your business, you likely focused the vast majority of your time, energy and money on the challenges associated with starting and growing it. That makes sense! BUT, it also means you may have deferred more strategic thinking about valuation growth or an exit strategy until (often too) much later in the process. How to determine what drives the value of your business. What you can do to accelerate the growth in the value of your business. What valuation growth strategies are best for you and your business. Why the right exit strategy is critical to building and growing the value of your business. What the right exit strategy for your business must include. How to prepare yourself and your company to pursue one or more of the strategic value growth & exit opportunities identified so you’re able to maximize the returns on your investment of time and money. 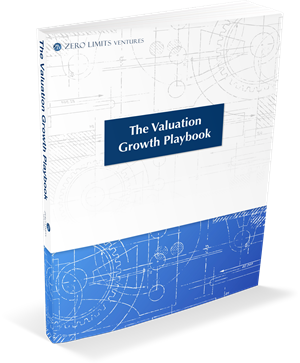 If you’re ready to know with absolute certainty exactly how to maximize the value of your business complete the form to download the Valuation Growth Playbook now. Steve has the uncanny ability to immediately lock-in on the key moves that yield breakthrough results. It’s like he can see all the playing pieces and all the available moves on a 3 dimensional playing board and intuitively knows exactly which moves to make to win big. He truly will give you a key advantage.